It is a win-win in this article on kitchen renovations to sell your house: before putting your house on the market, upgrade your drab wooden kitchen with a hand painted finish and remove a major obstacle to a sale. A well installed custom oak or pine kitchen has a useful life of 20-30 years, but with the best will in the world, it will eventually look dated and may even look drab. If you are looking to put your house on the market, your high quality, but old, kitchen could be a deal breaker. 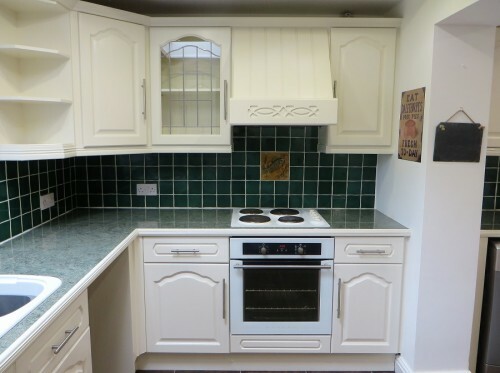 There is no doubt that this kitchen would struggle to inspire a buyer. 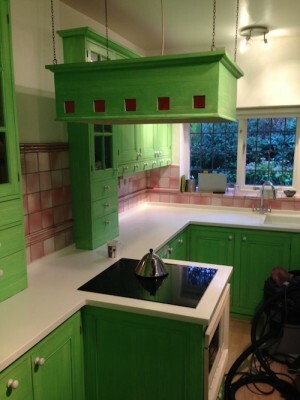 But if this newly hand painted wooden kitchen were in a house for sale, not only has the work added disproportionate value to the house, but the kitchen will now make a very good first impression on potential buyers. 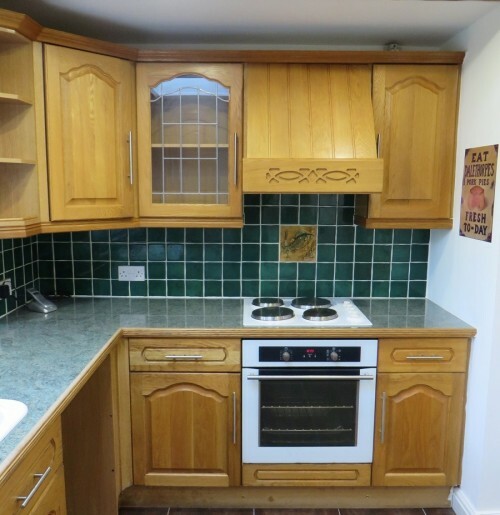 For under £3000, this older wooden kitchen is no longer an obstacle to the sale. If anything, this approach would improve the chance of a sale. 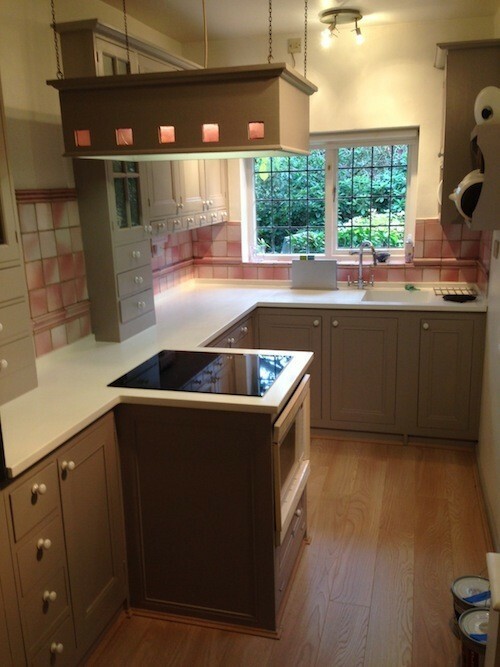 The above painted oak kitchen has a useful and long life ahead of it and a new owner has plenty of time to consider, or save for, a brand new kitchen.. 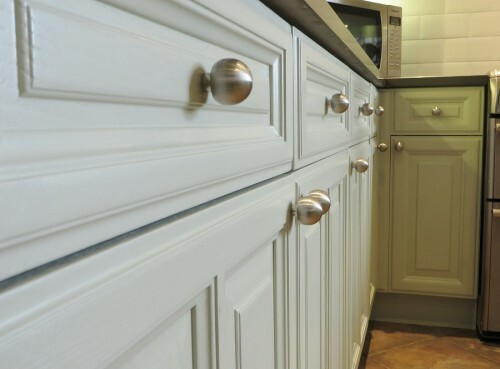 The paint finish on the doors is the same quality as you will find on the most upmarket painted kitchens. 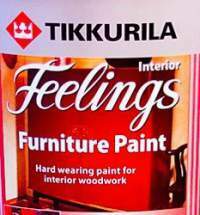 (Just feel it… ) We know it compares to the best, because many Traditional Painters have worked for the best companies in the UK. it is a very straightforward process to repaint in a colour they do want! If your kitchen is proving an obstacle to a sale, an upgrade can go a little further than a hand-painted finish. Traditional Painters can work closely with a skilled designer and fitting team, to introduce a few other stylish and cost effective options that will turn your blah kitchen into a talking point with buyers and influence a potential house sale for the better. If you’re thinking of ways to upgrade your kitchen without breaking the bank, fitting new worktops can be really effective. 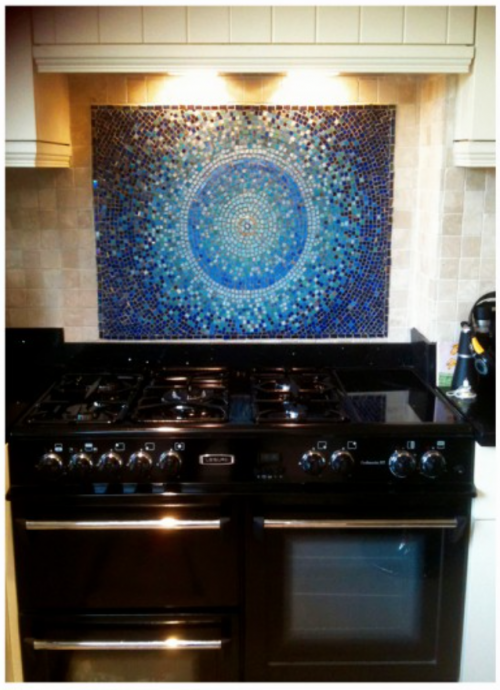 At one time, tiling was considered the only practical option for finishing the area behind the cooker, but now there’s a whole range of products available such as acrylic, aluminium, stainless steel and glass. There are some amazing splashbacks with matching upstands that have integrated LED colour mood lighting. as is lighting and window dressing. 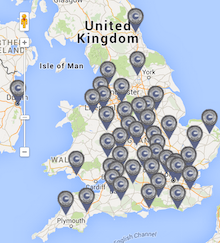 We’ve got lots of ideas for kitchen renovation. If you have any questions, and want to discuss kitchen modifications beyond a hand painted finish and new handles, please contact us .